Today, gazing out my window, enjoying a touch of soft melancholy, I watched the white flower petals drifting down from a plum tree. Soon they will be just trees again, not towering bouquets of pink and white. One petal broke my reverie. It fell up and to the left instead of down and to the right like all the others. I was grateful. Not just because I recognized the errant fluttering white thing out there (I did) but because its name told me to be: Mesoleuca gratulata, meaning something like “middle white gratitude inducing.” A good look at a front wing shows you why it is named Mesoleuca. The pretty gray markings are divided across the wing by a white band. To me this little moth is a sure sign of spring and always lifts my spirits, knowing I will see them for several months, almost always just out of reach. I recognized it because for several years it was one of my “unicorn” insects — a creature seen, but seldom captured (in my case with a photo). I would see them flying up among the redwood branches 20 or 30 feet off the ground. Last summer I watched one for several minutes until it finally landed low enough for me to get my shot. 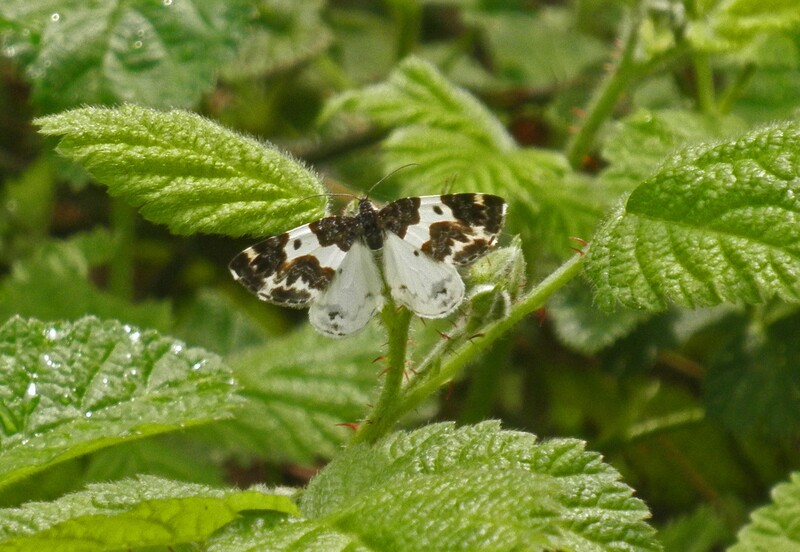 A bit of work with field guides told me it was a 'western white ribboned carpet moth.' This is not the bane of my great aunt, stinking up the place with mothballs made of paradichlorobenzene and napthalene to protect her Persian rug or wool socks. Their larvae actually prefer the leaves of members of the berry vine family to which I am delighted to leave them. The life of an entomological photographer, especially one who doesn't catch insects just to photograph them, isn't always easy. It is almost as if some species, like this one, can detect a camera, flitting away just when you're about to immortalize them. Like any hunter I eventually realized the disappointments I suffer only make the victories sweeter. So, I am happy to share this image of a dainty little local — one of my personal unicorns — who brings a smile every time I see it.